The Football season for the year ahead kicked off on Sunday last in Division 2 of the McCarthys Insurance, Brokers Senior League with an away game against Duagh. Played in perfect underfoot conditions between two evenly matched sides that saw the sides level on no fewer than 4 ocassions with the end result hanging in the balance right up to the last whistle. The opening half saw scores hard to comeby with defences very tight on their opponents and also some poor shooting efforts that saw Duagh kicking 5 early wides and it took until the 9th minute before the first score was registered with Killian Buckley swinging over an excellent point. From the kickout play swung to the other end and when match Referee, Mike Joy awarded a penalty to Asdee and up stepped Eoin Tydings who tucked the ball into the corner of the net. Points were exchanged by Martin Scanlon;(3) and Tom Scanlon with Paul O Carroll and Darren Russell replying for Asdee to tie up the game after 25 minutes. Duagh 0-5 Asdee 1-2. Duagh finished the half well and points from Martin Scanlon, Sean Broderick and Thomas McNamara say them ahead 0-8 to 1-2. Certainly the second half livened up considerably with the visitors getting stuck in early on and points coming from Eoin Tydings Darragh Keane and Mike Breen with Martin Scanlon getting one back for Duagh and by the 7th minute it was all square; Duagh 0-9 Asdee 1-6. The final quarter was hectic as play ebbed and flowed ; Ger McCarthy and Martin Scanlon for Duagh and Mike Breen and Darragh Keane for the visitors had the team on level terms after 16 minutes but a mighty point from Anthony Maher say the home side lead and even though Asdee had plenty of the play to at least get something from the game which they would have deserved; as the peppered the opposing defence in those final minutes but credit Duagh who held firm and the final scores came from Nigel O Connor and Darragh Keane with the home team just edging out the victory. This was a very encouraging display from Asdee who had Shay Doran playing well making his first start at wing back and Stephen Lynch listed amongst the substitutes. We also welcome back Darren Russell after a few seasons away and Con Carmody after a short lay-off. Asdee; James Kelly, Con Carmody, Martin Collins, Conor Keane, Jack Keane, John Doran, Shay Doran, Kieran Kelly, Darragh Keane, Mike Breen, Sean Keane, Capt, Darren Russell, Paul O Carroll, Eoin Tydings, Eoin Kennedy. Subs; Cyril Dineen for Conor Keane,inj, Dinny Dalton for Shay Doran. Referee, Mike Joy, Ballydonoghue. C C C. Congratulations to Patsy Coughlan on been returned to the C C C of the North Kerry Football Board at their first meeting of 2019 held in “Christys Bar” Listowel. Certainly the former Secretary, Vice Chairman, Registrar, Referee and Club Delegate has served both his Club and District Board well down through the years. Wishing him well on his appointment once again. SCOR. Asdee G A A Club were represented at the Estuary Print and Trophies Ballylongford Sponsored North Kerry Scor Sinsear Finals at the Marian Hall Moyvane on Sunday evening last where the Club were involved in both Recitation Donal Dalton and Leiriu; Kathleen Carmody, Mairead Doyle, Gerdie O Carroll and Jack Hennessy; however there was no joy as both came in second place missing out on a County Final appearance. Ballydonoghue were victors in both Leiriu and Recitation with Saoirse O Connor, Ballylongford taking the Solo Singing discpline. These will now go through to a County Final taking place at the Marian Hall Moyvane on this Friday February 8th, commencing at 7pm. McCarthys Insurance Brokers North Kerry Division 2 League. 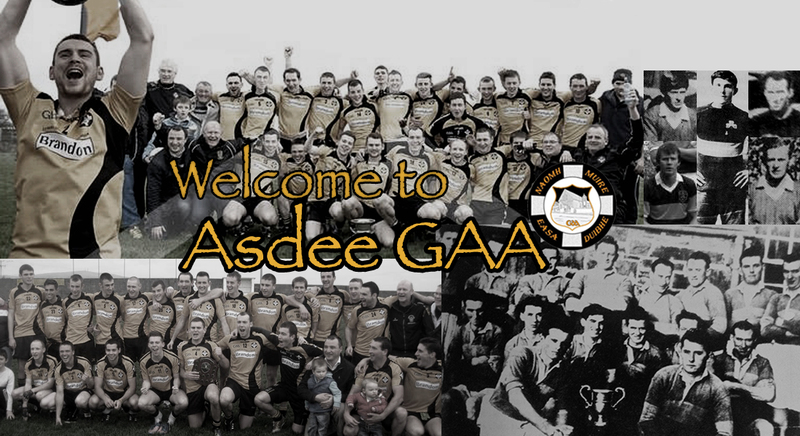 Sunday February 10th Asdee away to Ballyduff, Sunday February 17th, Asdee v Moyvane, Sunday February 24th Asdee v Knocknagoshel, Sunday March 3rd Asdee received a bye. MINORS. Minors will play in Division 3 “B” of the County League which is pencilled in to start on Saturday February 16 with Beaufort, Glenflesk, Castlegregory, Kerins O Rahillys, Renard/St. Marys joining Asdee/Ballylongford/Ballydonoghue. First outing will be a home game against Castlegregory.